Kennedy Events is a large-scale event management company, focusing on conferences, award ceremonies, and fundraisers. They allow their clients to focus on creating connections with their communities, while they bring everything together to pull off a flawless event. Kennedy Events had an active content component of their marketing plan, but they weren't sure if it was effective. In the words of Co-Owner, Paige Buck, “We had no idea whether we were whistling in the wind or preaching to the choir.” They had been promoting their expertise through their company blog, newsletter, and sporadically promoted through Kennedy Event's social media channels. In addition to their "business profiles" the two partners, Maggie and Paige were leveraging personal Instagram accounts but were unsure how their social platforms could be talking to each other in a cohesive way. They were also concerned about sharing personal vs professional content, and how to manage themselves as "personal brands" or advocates for their business. We walked Kennedy Events through The Brand Plan, adding on a social positioning component, which allowed us to dissect what each partner brings to the table. Our main objective was to create clarity around the kinds of conversations and content appropriate for business of Kennedy Events, as well as Maggie and Paige, considering their strengths as co-owners and their personal interests. To begin, we wanted to clearly define Kennedy Event's target clients, as well as the specific pain points or interests of these clients. 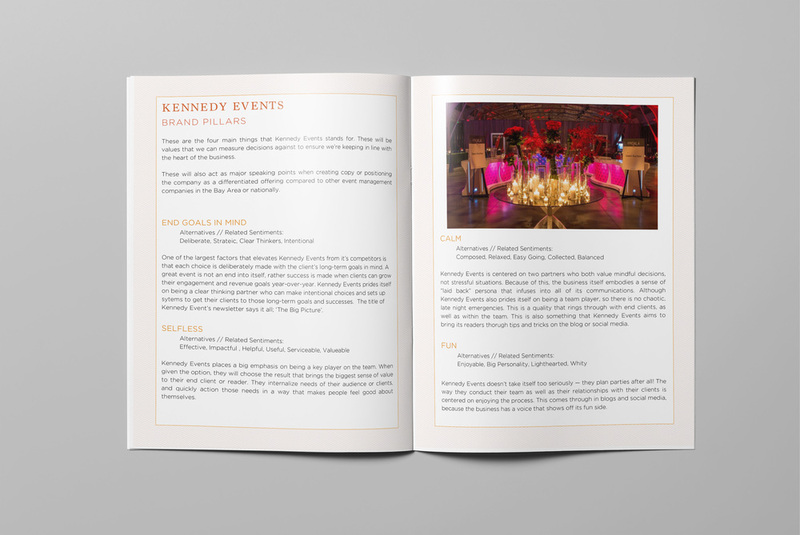 We then turned to examine Kennedy Events as a business, to further understand the kinds of values the business holds, and how those values shape their specific method when offering event management services. Kennedy Events offers their clients long-term strategic thinking about how events fit into business growth goals, a level of thinking that some event companies don't approach. We teased this to the surface as a differentiator for Kennedy Events, a point to make clear in their positioning. Next we honed in on Maggie and Paige's personalities, experience and skill sets to help create their individual online voices. We outlined their unique areas of expertise and resources they could individually offer their community, and in turn used this to informed their specific social channel recommendations with targeted areas of focus. We delivered their plan, with three sections flushed out: positioning and communication guidelines for Kennedy Events (the business), Maggie (as an owner), and Paige (as an owner). We also offered "personal brand mentors" to Maggie and Paige, so they could practice sharpening and differentiating their own voices in their personal social communications. Kennedy Events came back to to Prim'd Marketing when they were ready to re-brand their business to bring their look and feel more in line with the company they've come to be as they've scaled their team, and grown in the kinds of projects they're now working on. Kennedy Events is a creative, confident and bold company — but their clients often rave that it's their kind, warm and fun nature that makes the efforts that go into pulling off large scale events not only effective but enjoyable along the way. We focused in bringing bright, bold color blocking to underscore their sense of professionalism and boldness their team brings. We also drew in warm colors like teals and oranges to bring the warmth and friendliness to the brand. Paige and Maggie consider The Brand Plan for Kennedy Events game changing for their business. In the months after receiving their The Brand Plan, Kennedy Events immediately updated some of the language on their website to reflect their values and differentiators. They're also leveraging those pieces across their social media channels. Their team is focusing on rolling out their new identity suite, refreshing their website, and pulling their whole brand together to reflect their evolving business.